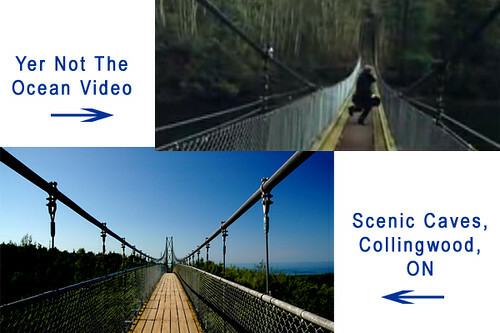 We recently determined that the suspension bridge featured in the Tragically Hip's "Yer Not the Ocean" video isn't the Capilano Suspension Bridge in North Vancouver. Some suggested it might be the suspension bridge at Scenic Caves in Collingwood, Ontario, but as you'll see below, that's not it either. What about Thunder Bay's Eagle Canyon bridge? I was checking out pictures of the Eagle Canyon bridge, but I don't think it's a match. 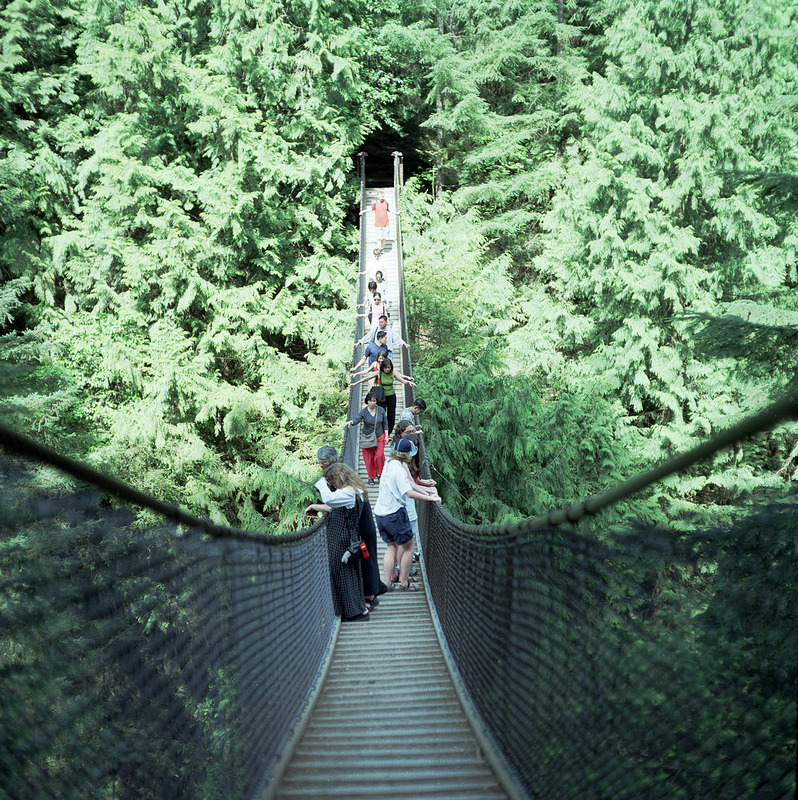 Its the lynn canyon suspension bridge in Vancouver, actually only about 15 minute drive from the capilano suspension bridge. Most tourists go to the Capilano bridge which charges money, but the better more scenic one (and FREE) is the lynn valley. Its definitly it. heres the link, see for yourself, or look up other pics using google, "lynn valley, or lynn canyon suspension bridge" Enjoy. Geoff, I'm not convinced. Tonight I'll throw the two pictures side by side and break it down. I've stared at this for the past hour, but there are too many differences. saw your web pages while I was searching for the location of the bridge shown in the Ontario Travel commercials. I called Ontario Travel, they confirm its the Eagle Canyon suspension bridge in the commercial. If you look at the site, you will notice they actually have two bridges, close together, and I believe the old one is the one in the commercial. Mike, I've been looking too, not sure about the Lynn Canyon one. I saw Capilano last week in person, doesn't seem viable either. In both cases, compared to the below screenshot, there is an extra run siding on the bridge floor, and some support on the end of the bridge... of course... this could be music video magic... not sure. So, I really don't know, but I'd like to know too. Found It (or at least an image). According to the caption, this is near Vancouver, and the area this person said they were near with this photo is just north east of North Vancouver. I know Capilano and Lynn are around here too, but doesn't quite look like them. James, that's it. Good work.